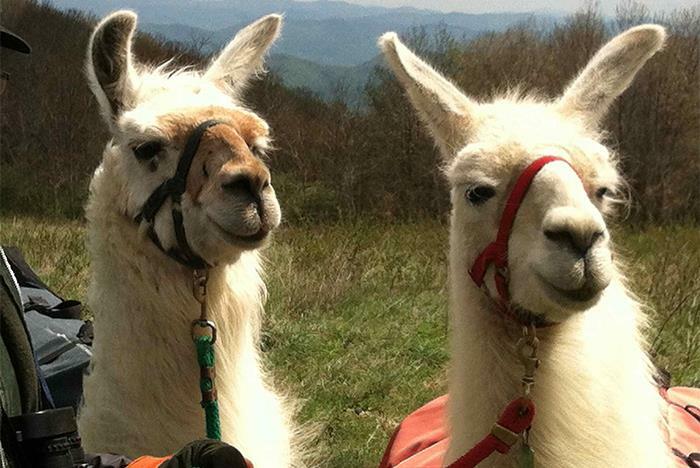 For a memorable Smoky Mountain hike, why not embark on a trek with some llamas? 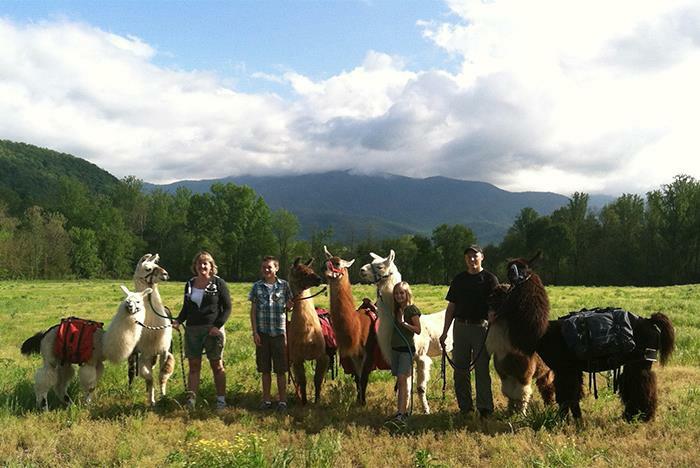 You’ll join an experienced guide along with fluffy and trained llamas up the foothills of the Smoky Mountains. They’ll carry your gear while you marvel at the views, take in the wildlife and scenery, and create lifelong memories on this incredible outdoor excursion. Hikes are available in varying levels of difficulty to accommodate every hiker. 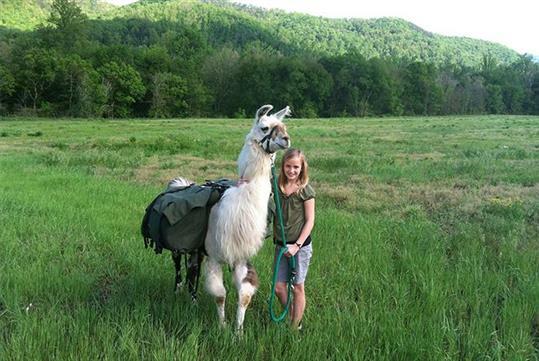 Professionally trained llamas carry your gear while you explore the Smoky Mountain foothills. Choose from a variety of treks and experiences, ranging in difficulty. The llamas will not spit at guests. 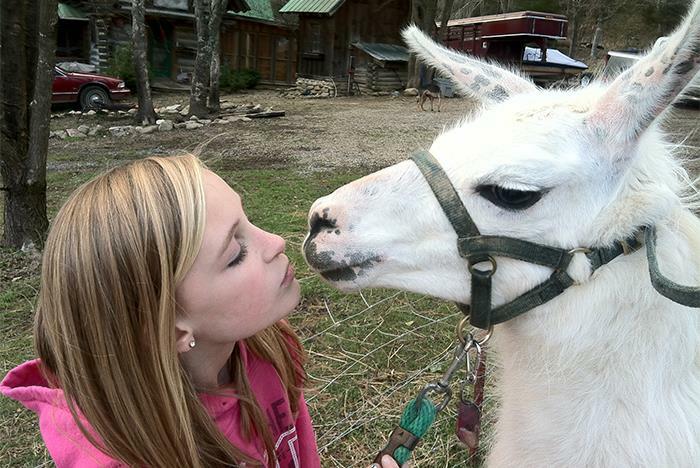 If you’re not ready to hike, choose the Llama Farm Visit, where you’ll pet and feed the llamas. Stunning scenery, lovable llamas, and Smoky Mountain memories -- Your memories aren’t complete until you’ve experienced the unique hiking adventure that is Smoky Mountain Llama Treks. 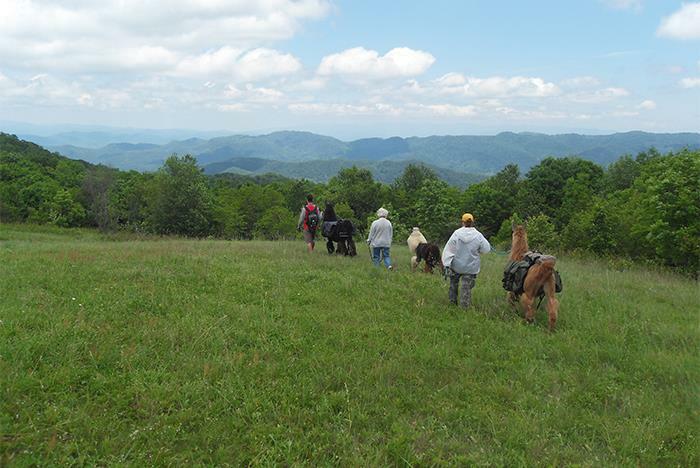 Enjoy spectacular, scenic, Smoky Mountain trails accompanied by an experienced guide and friendly, fluffy, professionally trained, pack-llamas. From leisurely nature walks to trails for the adventurous trekker, Smoky Mountain Llama Treks has the perfect outdoor adventure for you and your family. Discover a patch of wild blackberries, lie quietly among the soft grasses of flowered fields, wade barefoot through babbling brooks, hike to the top of a picturesque peak, and photograph the distant mountain vistas. Let our llamas carry your gear and nibble mountain wildflowers while you relax, enjoy your hike, and make a Smoky Mountain memory. Their fluffy, pet-able llamas don't spit, kick, or run off—rather, the gentle pack animals carry loads for hikers on treks through fields and woods. Though the llamas can't be ridden, their ability to carry food and gear makes it easier for hikers to enjoy mountain views and cartwheel down the trails. Do we ride the llamas? No. 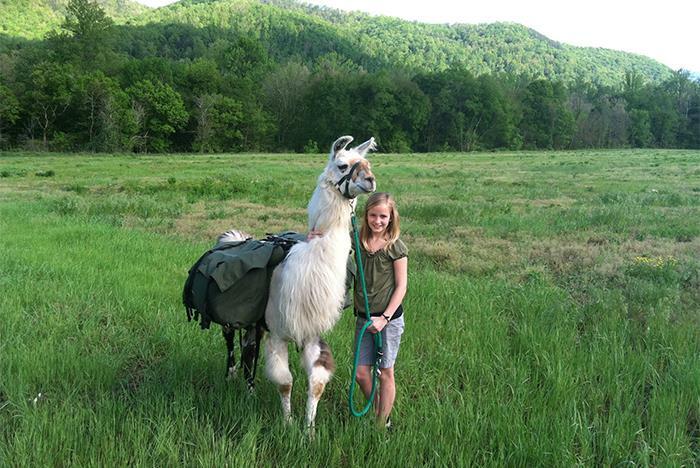 The llamas are professionally trained to carry your hiking gear up the trail for you. Will the llamas spit on me? No. While spitting is a natural behavior for llamas, they will not spit on hikers. Can I pet the llamas? Where does each hike meet? Each hike and experience meets at a different starting point. Llama Farm Visit: 640 Padgett Mill Rd Cosby, TN. Padgett Mill Treks: 640 Padgett Mill Road, Cosby, TN. Creek Hollow Trail: Foxfire Mountain Zipline Park, Sevierville, TN. How long are the hikes? Padgett Mill Treks: Short Trek – 1 mile and approximately 1 hour, Extended Trek – 2 miles and approximately 2 hours. Creek Hollow Trail: 2 miles, approximately 2 hours. What happens if we are late or get lost? Please give yourself extra travel time if you are not familiar with the area. As a courtesy, tours will wait 30 minutes for you to arrive, then we will begin the trek without you. Unfortunately, if you are late and we leave without you, you will lose your deposit. Yes, there are one or two guides leading every trek. Our guides are trained in CPR and emergency first aid to ensure your safety along the trails. Will we be hiking with others? Small hiking groups are often combined. If others have reserved on the same day, we will all hike together. If you would rather hike without others, please request a private hike when you make your reservation. Can I carry my baby in a backpack? No, our insurance does not cover anyone under five years old. Can children hike without their parents? Can we bring our dog(s)? No, while our llamas and dogs know and love each other, unfamiliar dog(s) could upset the llamas (or vice versa). We want you to be able to relax and enjoy the scenery and peaceful atmosphere without concern. What happens if I need to rest during the hike? We make many frequent stops to rest and drink. If you need to rest longer or more often, please let us know. What happens if I can’t hike the entire trail? We do not force hikers to continue if they feel they cannot go on. Hikers may return to the trailhead (on their own) while the rest of the group continues on the trek. If this should happen, unfortunately, you will not receive a refund. How do we get back? All trails are circular loops and end up at the same trailhead where we begin. Do you provide beverages on any treks? No, you must bring your own drinks. Please bring at least two drinks per person in hot summer months. We provide coolers with ice that the llamas will carry for you. Do you provide food on any treks? No. For lunch and overnight treks, you must provide your own food and drinks. Sub sandwiches and water bottles are a good suggestion because they fit perfectly in our special thin llama coolers. We provide tables and chairs along with coolers and ice for treks that include a picnic meal. Yes, you may bring whatever drinks you’d like, but please bring plenty of water too. What else can I bring along? What should I leave at home? Please do not bring MP3 players, games, or computers. (We want you to enjoy the sights and sounds of nature.) Large purses and/or backpacks should also be left behind. If you feel you must bring extra items, you will have to carry them. Are there restrooms along the trails? No, most trails do not have any restroom facilities. We provide toilet paper if you need to “visit the woods." The Creek Hollow trail has an outhouse. Will I get wet or muddy on the trail? Expect some mud on the trails if it has been rainy a few days before your trek. Also, there are some trails where we walk in the creek. You can bring water shoes to change into if you like. Will I step in manure? The llamas usually ‘go’ while standing in water. While there may be some llama manure on the trails, you might not even notice it. A llama’s three chamber digestive system is very efficient, and their manure contains less organic content than that of other livestock. There may be some horse manure on the horse trails we use, but it is usually dried up and off to the side. Will we encounter wildlife on the trails? We see a lot of birds along the way, hawks and even eagles. It’s possible to see other wildlife as we are walking through their habitat, but they usually hear us coming and make themselves scarce. Can we bring snacks for the llamas? Yes! The love oatmeal cookies, graham crackers, and bananas. Do I have to lead a llama? No, you do not have to lead a llama if you prefer not to. However, our hiking rates are charged per person, not per llama. Do the llamas spit, kick or bite? No. Our llamas have been thoroughly and properly trained. They are very gentle and do not exhibit aggressive behaviors such as biting, spitting or kicking, toward people. A llama may kick if it is startled, so we caution our guests not to stand where the llamas cannot see them. What happens if I drop the llama’s lead rope? The llama may wander to the side of the trail to nibble on grass or leaves, but it will probably just stand and wait for you to pick it up. What happens if my llama eats a poisonous plant? There are only 3 plants that a llama should not eat. Your guide will show you pictures of them before you leave and will point them out as you pass them along the trails. If your llama grabs a bad leaf or two, there is no need to panic, a few leaves are harmless.